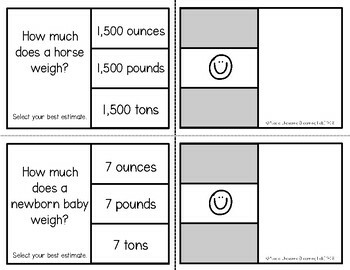 Units of Measure practice just became a lot more fun! 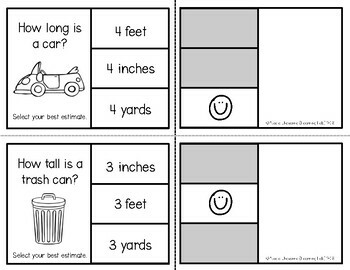 These self-checking Pin and Spin cards will get your students practicing customary units of measure for length, weight, and volume. 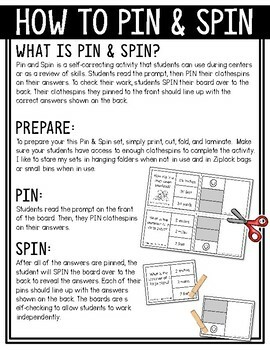 30 individual half-page Pin & Spin cards. There are 10 cards that deal with length, 10 with weight, and 10 with volume. All of the cards work with customary units of measure. Print. Cut. Fold in half. Laminate. Play! Students read the prompt on the front of the board. Then, they PIN clothespins on their answer. After the answer is pinned, the student will SPIN the board over to the back to reveal the answer. Their pin should line up with the answer shown on the back. The boards are self-checking to allow students to work independently.